You're in for a world of pampering. 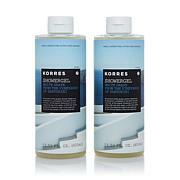 This creamy, foam shower gel cleanses your skin while indulging your senses with a beautiful scent. How sweet it is — who knew cleansing could be so pleasurable? Ingredients: Water (Eau), Cocamidopropyl Betaine, Sodium Laureth Sulfate, Sodium Cocoyl Isethionate, Fragrance (Parfum), Coco-Glucoside, Phenoxyethanol, Glyceryl Oleate, Castoryl Maleate, Benzyl Alcohol, Sodium Gluconate, Arginine, Citric Acid, Potassium Sorbate, Polyquaternium-7, Guar Hydroxypropyltrimonium Chloride, Sodium Dehydroacetate, Imidazolidinyl Urea, Lactic Acid, Hydrolyzed Wheat Protein, Althaea Officinalis Root Extract, Helichrysum Arenarium Flower Extract, Aloe Barbadensis Leaf Juice, Tocopherol. 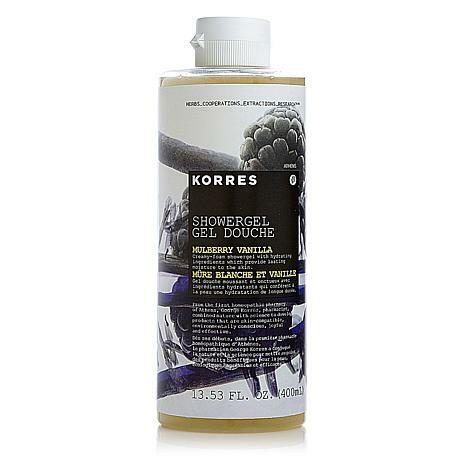 Korres' Mulberry Vanilla shower gel is fantastic. The fragrance is heavenly. Not too much vanilla. Just a smidge of the flavor plus the mulberry. And it cleans beautifully, and is hydrating. 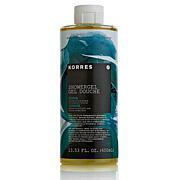 A plus for my dry skin, and one of the reasons I like Korres so much.